As one of the leading florists in the U.S., Phillip's delivers elegant roses, fresh flower bouquets, blooming and green plants, and fruit and goodies baskets throughout the U.S. and Canada via its computerized sending system and network of more than 25,000 professional affiliate florists. 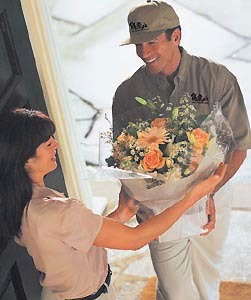 Discount flowers shipped by next-day air are also available. A complete menu of popular items is available online for birthdays, anniversaries, get well wishes, new babies, holidays, expressions of sympathy, and almost every other occasion. Each florist-delivered gift is professionally designed and locally delivered, to ensure the highest level of quality and service, and our "next day flowers" are shipped fresh from the source for exceptional value. A personal enclosure card message is included at no extra charge, and satisfaction is always guaranteed. In the U.S. and Canada, same-day florist delivery is generally available Monday through Saturday on orders received before 1:00 pm weekdays, and 12:00 noon Saturdays, in the recipient's time zone (excluding holidays and peak floral delivery periods.) Otherwise, next-day delivery is the norm. IMPORTANT-- At peak floral delivery periods, such as Christmas, Valentine's, and Mother's Day weeks, please order at least one or two days in advance if possible. Florist delivery is NOT available in most areas on Sundays or legal holidays. So, while every effort will be made to accommodate such deliveries when possible, items requested for delivery on a Sunday or legal holiday may be delivered the day before or day after the date requested, if necessary. On florist delivered orders received at least 24 hours in advance (excluding peak floral delivery periods), we will be happy to honor requests whenever possible for AM delivery, PM delivery, or delivery by a specific afternoon time (e.g., by 4:00 p.m.) For same-day orders placed by 12:00 noon (recipient's time zone), you may also request delivery by 5:00 pm. Please note, however, that since we use professional local florists to individually design and deliver these gifts, the time of delivery is sometimes beyond our control and, therefore, cannot be guaranteed. Charge your online purchase with Visa, MasterCard, American Express, Discover, Diners Club, or your Phillip's charge account. Prices for each item are displayed online (in U.S. dollars.) Applicable sales tax (7.50%) and flowers by wire service or shipping charges are itemized in our Shopping Cart before you place your order. Special savings are available for multiple gift sending, regular corporate ordering, and nationwide charitable groups. For additional information, click here, or call today. .
For your shopping convenience, a wide variety of popular items may be viewed online. Each of these beautiful gifts is individually created with the freshest flowers available, and most are offered in a variety of sizes and prices to meet differing budgets. Of course, while the items shown are all representative of overall style, color scheme, and value, specific flowers and containers may vary in some cases due to design interpretation and availability or to meet our quality standards. You'll be happy to know that we respect our customers' privacy and, unlike some other companies, do NOT sell or share our customer information with other parties for any commercial purposes other than order fulfillment, providing our online services, maintaining and improving our web site, and confidential site activity and sales tracking. For additional information, see Privacy and Security. Phillip's enjoys an especially strong following in the Chicago area, where the company was founded in 1923. Today, seven family-owned shops, a 30,000 sq. ft. design center, a commercial interior plantscaping and holiday decorating division, and an affiliated wholesale fresh flower company serve Chicago and over 150 suburbs with a complete range of professional floral services for weddings, parties, and corporate events. To learn more, see our Chicago Area Locations & Services. For additional information or assistance, click here to send comments and questions or give us a call. Our main phone number is 630-719-5200. Our toll-free phone number in the U.S. and Canada is 1-800-356-7257 (1-800-FLORALS.) Our mailing address is, Phillip's 1-800-FLORALS, 524 N. Cass Ave., Westmont, IL 60559, U.S.A., and you may contact us by email.